If you wrote a post on this or any of my other discussion topics today, Tuesday June 7st, please leave your link in the Mr. Linky before midnight Central time (US) and you will be eligible to win a prize. Sound effects in audiobooks are a divisive topic. There are audiobooks I have really adored that good friends have nearly dropped audiobooks, had them almost ruined by the addition of sound effects. Where do you come down on this issue? Personally, I find that some, but not all, titles are enhanced by judicious use of sound effects. For example, in the above mentioned title, there were only three sound effects, although they were used multiple times :a train whistle, a violin song, and the wind. All three were major plot elements with thematic basis, and for me they enhanced the story. Similarly, the audiobook of Matched by Ally Condie occasionally used sound effects. In Matched the effects were used in a way that made me feel the other-future-ness of the storyline, which enhanced the book in a way the narrator – although talented – would not have been able to do. I very much do not want sound effects in every audiobook I listen to, but for some titles, they work for me. I know which book you are talking about, and in that instance found the effects haunting and appropriate to the text, particularly the violin music. I know some of my fellow bloggers did not agree with my opinion. I haven’t come across an audiobook with sound effects so far. I’ve also heard that some people love the group dramatizations. Look forward to experiencing both. Not sure if I’ll like the sound effects, but the dramatization I really want to try. Jen – great discussion topic. Sound effects can really add something special – but they must be tasteful! I also listened to Matched and I feel like those sound effects didn’t do it for me. They just felt like random music spots when I was listening. Didn’t help that I didn’t really care for the book either but that’s okay :o) Glad you liked it! I think sometimes whether or not you cared for the book otherwise makes the difference. I think I might be the other blogger in your post. LOL! This is a great topic and I had fun with it. I do not like sound effects. I hate them, really. I think I am in the minority, though. Oh Jen, can you delete my first link? The link is right, I just didn’t know it said all THAT. Thanks sweetie! Thanks Jen for the question; I read some responses of other bloggers after I posted mine, and they made it even more fascinating! Looking forward to tomorrow’s question. There is another sound effect employed by some audio publishers. Brilliance Audio has been known to modulate the sound of their narrator’s character conversations to make it sound like one of them is talking over a phone. It’s a nice bit because it’s not too intrusive (unless you have an audiobook heavy with them). Given that it’s an effect used on TV/film for so long, it almost goes unnoticed by the listener. That is until you hear another audiobook that doesn’t employ the sound effect. Personally, I usually like sound effect and music. They’re used pretty judiciously in the audiobooks I tend to listen to (I believe thrillers/shoot-em-ups often have more). I even like when music marks the movement from one chapter to another, which may be a bit old-fashioned of me. This is one of those things about being on the publisher side that drives me crazy: we want to make our audiobooks so that EVERYONE enjoys them, but issues like this seem to be split 50/50. I’ve noticed them most often in Hachette audios, and I definitely think you guys use them judiciously. Honestly, I didn’t even NOTICE the sound effects in BOSSYPANTS, which I think says something about just how into her story I was and just how well the sound effects were used. Have not experienced many that include sound effects, but I don’t want to be distracted from the story. I really don’t like sound effects, so I chose to write about multiple narrators today. I agree – some sounds effects are good. Too many are overwhelming! 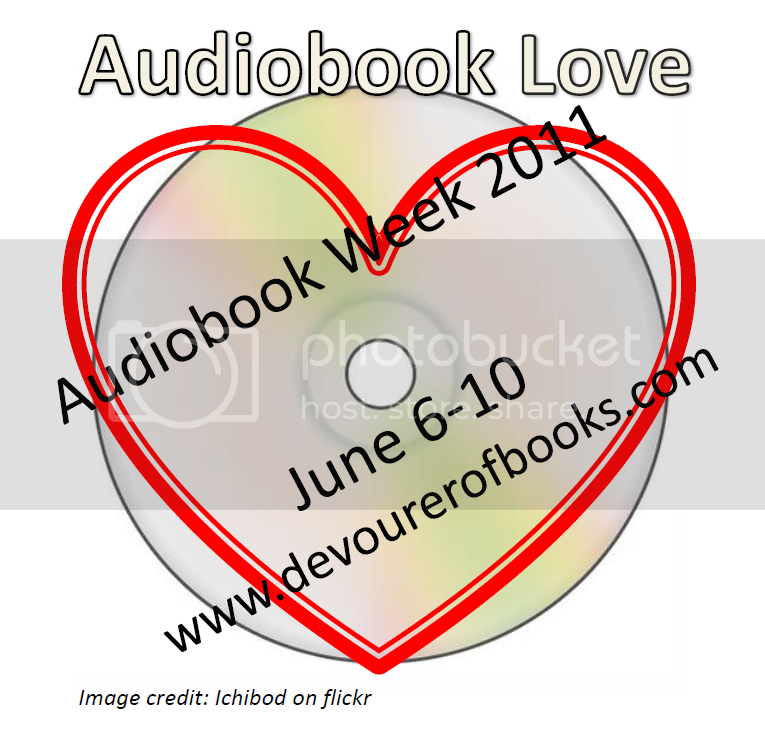 I also haven’t experienced many audio books with sound effects – maybe because I’ve only listened to 12 so far! I’ve only listened to a few audiobooks that featured sound effects and I didn’t care for them. Maybe I haven’t listened to the right one yet. I have listened to some old-timey radio show kinds of stories with sound effects and have enjoyed them – but I take them for what they are – old-timey! I’m not sure I’ve listened to anything with sound effects, other than music. Since I am so new to this…I haven’t encountered sound effects. Now, I’m curious….